First of all- calling all BOISE peeps! I’ll have shop set up at the local Holiday House Boutique starting tomorrow (Thursday 3/12). Swing by and sample any of the products from our Shop! I will also have a very small supply of our brand new book that’s not available yet in stores! I’ll bring the books with me Thursday morning (I can’t say what time yet, but probably some time between 9-11), and if there are any left, on Friday from 1-2 pm. I hope to see some of you there! 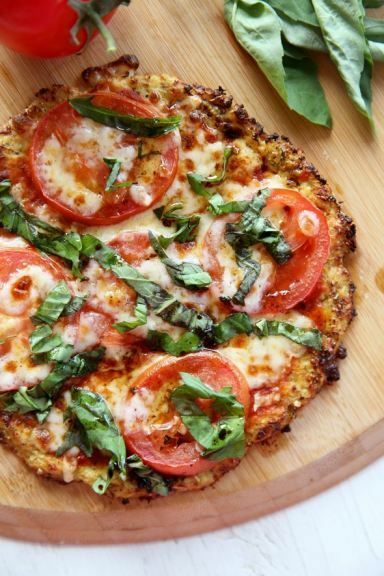 Make delicious and healthy pizza crust from cauliflower! Low calorie and gluten free. Place cauliflower in a heat-safe bowl and cover with plastic wrap with a few holes to vent. Microwave for 4 minutes, remove plastic, and stir to cool it off a little. Place cauliflower in a fine mesh strainer and use a rubber spatula to press cauliflower against strainer, pushing out any liquid. Use several paper towels and press down to absorb more liquid. You could also ring it out in a clean, dry tea towel. Place cauliflower in a bowl and fluff with a fork. Add basil, oregano, garlic, Parmesan, and mozzarella. Mix well and taste. Add salt to taste (I find depending on the saltiness of my Parmesan, I need a few pinches of salt). Add egg and stir to blend completely. Press mixture out onto a baking sheet lined with parchment paper that's been sprayed with non-stick spray (I've found parchment produces better results that a silicone baking sheet). Press out to about 1/4 inch or slightly thicker. Keep mixture tight together and in an even layer. You can bake one large pizza or multiple smaller ones. Place pan in oven and bake until golden brown. My pizzas tend to vary in time so sight is the best indicator. Generally 15-20 minutes is a good time frame, and it should be starting to brown on top. Remove from oven, top with desired toppings, and return to oven to melt cheese, etc. Let rest for a couple of minutes and then slice and serve. 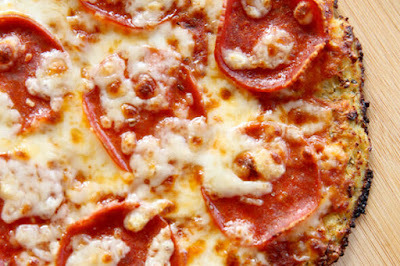 0 Response to "How to Make Cauliflower Pizza Crust"